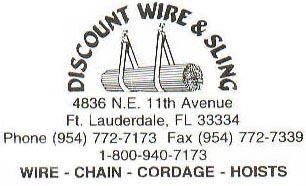 Discount Wire & Slings staff has over 60+ years of experience and dedication in helping YOU our customer! If you would like a custom proposal for industrial or marine cordage, chains, wire rope or hoisting equipment needs? Click Here. If you would like to contact us by phone we are available from 8:00 AM to 5:00 PM EST at 800-940-7173.